A classic crewneck t-shirt made from a soft compact pima cotton. Designed to last, pima cotton is smoother and stronger than conventional cotton making this an excellent, tried and true everyday t-shirt. A) Chest - Measure the Chest under the armpit straight to the other armpit, at the points where the sleeve inserts the T-shirt. For around chest measurement, double the chest value of our chart (ie: Large = 2 x 56 = 112cm). 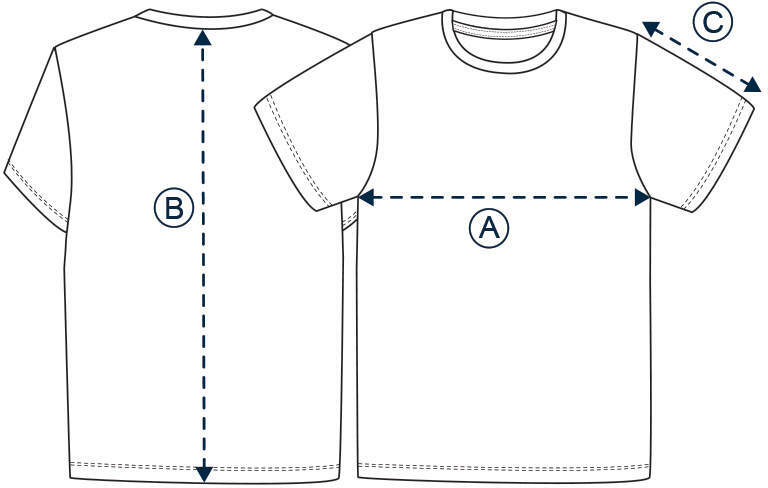 B) Center Back Length - Measured at back from below the rib till bottom of T-shirt. C) Sleeve - Measured from the shoulder seam and down the outer sleeve to the bottom of the cuff.